Why Make Maths Fun in the Early Years EYFS & All Things Plastic? Home > Forum posts > EYFS > Why Make Maths Fun – & All Things Plastic? Why Make Maths Fun in the early years? As someone who loves teaching maths, I know that the ‘fun’ in maths is in using maths to think and solve problems –to estimate and calculate, to see patterns and compare, to use conjecture and logic. So why do so many teachers in the early years work so hard to make maths ‘fun’? Could it be that they feel forced into teaching only the basics – knowledge devoid of context – or that they simply are unaware of how the real world offers such beauty, intrigue and challenge for young mathematicians? If you look on Twitter or Facebook it won’t take you long to see examples of what I describe as pointless ‘fun’. Plastic cubes in the water tray, Numicon in the sand, plastic numbers hidden in ice, photocopied numbers with glue and glitter – what is this all about? It strikes me as plastic fantastic – ‘Toys R Us’ maths with a bit of early years resource thrown in – and I can’t bear it. So please let’s ask the question – why do we do this? My worry is that we’ve become so caught up in the key skills of maths that we’ve lost track of what makes maths fascinating. Maths isn’t just about counting plastic objects, it’s not just about recognising a limited number of plastic shapes. Maths is wonderful, in the proper sense of the word, from the building of The Shard to the repeated patterns of a fir cone. So what does good teaching look like? The basics of maths – number recognition, counting, calculating and so on needs focus, of course. Children need to acquire key knowledge and skills so that they can use this knowledge to think creatively and solve problems. So let’s teach these skills professionally. If you are using maths equipment – Numicon, number lines, magnetic numbers and so on, then do so in the context of adult-led activities. Children are keen to learn and happy to engage in small group-focused activities which introduce and help to reinforce key concepts and skills. 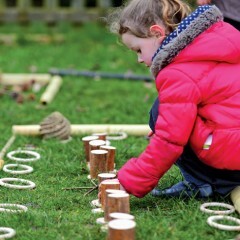 These don’t need spicing up with other play things – sand, water, ice, glitter – or mixing with natural materials – keep these honest to what they are – pure maths activities. Then make sure that there are lots of opportunities for children to use their growing knowledge in your provision – as they build with blocks, as they pour and fill in the water tray, as they roll and cut out shapes to make biscuits in the dough. And make sure that maths is part of your everyday language as you interact, enthuse and engage with children. And what about my maths area? If we are not careful children will see maths as boring and pointless –as something uninspiring and not for them. So, from someone who loves maths, please don’t reduce it bargain basement maths. Let’s open up a world of problem solving that has real life meaning. Maths is all around us, there for the taking. At the weekend I will be taking my own children for a walk near our home. We’ll take lots of containers and bags and will collect all sorts of natural materials, from smooth conkers with their cases split in half to leaves of all shapes and sizes – need I say more about the beauty of the world, its intrigue and challenge. There are no community comments for this post.